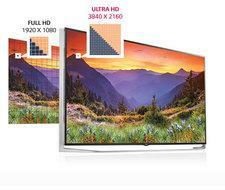 Is Your Ultra HD TV REALLY an Ultra HD TV? 1. Display Resolution: Has at least eight million active pixels, with at least 3,840 pixels horizontally and at least 2,160 pixels vertically. 2. Aspect Ratio: Has a width-to-height ratio of the display's native resolution of 16:9 or wider. 3. Upconversion: Is capable of upscaling HD video and displaying it at Ultra High-Definition resolution. 4. Digital Input: Has one or more HDMI inputs supporting at least a 3,840 x 2,160 native content resolution at 24p, 30p, and 60p frames per second. At least one of the 3,840 x 2,160 HDMI inputs shall support HDCP revision 2.2 or equivalent content protection. 5. Colorimetry: Processes 2160p video inputs encoded according to ITU-R BT.709 color space and may support wider colorimetry standards. 6. Bit Depth: Has a minimum color bit depth of eight bits. These core characteristics build upon the first-generation UHD characteristics released by the CEA back in October 2012, which required only three elements: 1) a display resolution of at least eight million active pixels, with at least 3,840 horizontally and at least 2,160 vertically; 2) an aspect ratio with width to height of at least 16:9; and 3) at least one digital input capable of carrying and presenting native 4K format video from this input at a full 3,840 x 2,160 resolution without relying solely on upconverting. At least one of those HDMI 2.0 ports must also support HDCP 2.2 content protection, designed to provide the secure transmission of content from a future UHD source to the TV. Right now, no such source device exists, and no content that I'm aware of contains the encryption, but it is coming, so it matters whether or not your UHD display can handle it (or be upgraded to do so). HDMI 2.0 and HDCP 2.2 don't necessarily go hand in hand righ t now, so it's wise that the CEA chose to add this provision. Click on over to Page 2 for the rest of the Core Characteristics . . .